Our German holiday weather is taking no mercy on us. It's back at cold, rainy and extremely windy weather. We are back to board games, dice games, card games. My sister and I finished a 1500-piece puzzle in 3 days. It's that horrible outside. Tomorrow we are going back to Hamburg. Out of 14 days, we had about 4 good ones, weatherwise. I thought I could spare today's recipe until winter but I have no choice. The current weather in Germany just calls for soup. 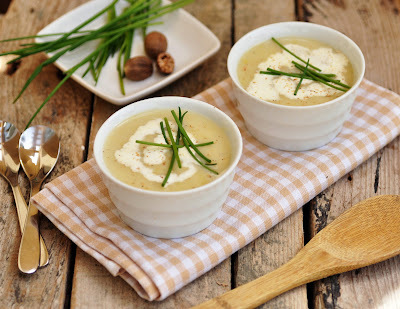 Here is an old classic: leek potato soup. We keep this soup as simple as possible and really just throw in leeks and potatoes. Fancy herbs, garlic, onion? No thanks. It is our lazy day soup, it involves little chopping, little stirring. It can be on the table in 20 minutes or so. Just what we needed these days, so we can crawl back under the blankets on the sofa as quick as possible. Wash the leeks and cut into rings. Heat olive oil in a large pan over medium heat. Add the leeks and fry until softened, about 5 minutes. Stir occasionally. Add chopped potatoes and vegetable stock. Bring to a boil, then simmer on medium heat until potatoes are cooked and very soft, about 10 minutes. Take off the heat and blend the soup in a food processor until smooth. Transfer soup back into the pan. Stir in a splash of cream and season to taste with salt and freshly grated nutmeg. Serve hot with bread.